Huw joined CHEME in 2012 as a research officer in health economic methodology. Since then Huw has worked on a number of grant applications including the cognitive rehabilitation for Parkinson’s disease project and a project on digital dictation for BCUHB. 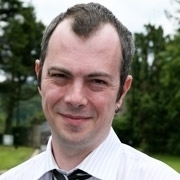 Huw’s background is in applied economics, having received a masters in Applied Economics and Data Analysis from the University of Essex in 2003, and has worked as a research officer at Swansea University and Bangor University’s business school and law school before joining CHEME. He is currently studying for a PhD in Adverse Childhood Experiences. Huw is also a musician and plays alto saxophone with local bands Drymbago and Geraint Lovgreen. Hindle, J. V., Watermeyer, T. J., Roberts, J., Martyr, A., Lloyd-Williams, H., Brand, A., ... & Clare, L. (2016). Cognitive rehabiliation for Parkinson's disease demantia: a study protocol for a pilot randomised controlled trial.Trials, 17(1), 1. Hughes, D., Charles, J., Dawoud, D., Edwards, R.T., Holmes, E., Jones, C., Parham, P., Plumpton, C., Ridyard, C., Lloyd-Williams, H. and Wood, E., 2016. Conducting Economic Evaluations Alongside Randomised Trials: Current Methodological Issues and Novel Approaches. PharmacoEconomics, pp.1-15. Davies R, Lloyd-Williams H (2014), “An Investigation of the Potential for Wales-Level Analysis of the British Household Panel Survey and Understanding Society: An illustrative analysis of poverty dynamics in Wales”, Welsh Government Social Research No 31, 2014. Dobbins T, Plows A, Lloyd-Williams H, “’Make do and mend’ after redundancy at Anglesey Aluminium: critiquing human capital approaches to unemployment”, Work Employment and Society, Published online December 6 2013. Edwards RT, Charles J, Lloyd-Williams H, (2013) “Public health economics: a systematic review of guidance for the economic evaluation of public health interventions and discussion of key methodological issues”, BMC Public Health 2013, 13: 1001. Davies R, Lloyd-Williams H, Wadsworth E , ‘Analysis of the correlates of self-reported work related illness in the Labour Force Survey’, Health and Safety Executive 2013. ‘Worker representation and consultation on health and safety: An analysis of the findings of the European Survey of Enterprises on New and Emerging Risks (ESENER)’ European Risk Observatory Report. 2012. ‘An Anatomy of Economic Inequality in Wales’ WISERD/RRS/002, Lloyd-Williams et al 2011.